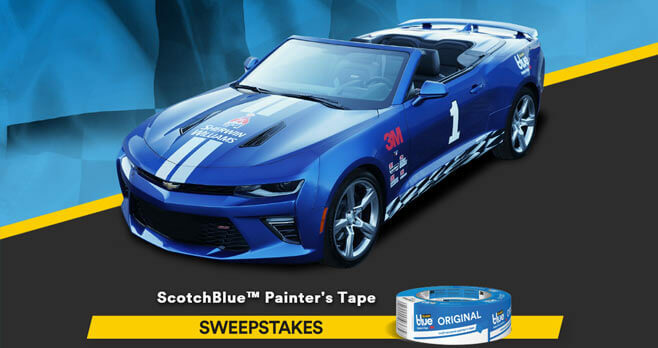 Enter the ScotchBlue Pro Painter’s Tape Sweepstakes for a chance to drive home a 2018 Chevrolet Camaro SS. Plus, win a VIP race trip to the November 2018 race at Texas Motor Speedway. A grand prize valued at $58,000. Eligibility: The ScotchBlue Pro Painter’s Tape Sweepstakes is open only to legal residents of the 50 United States and the District of Columbia who are 18 years of age or older and the age of majority in applicable jurisdiction as of the date of entry and have a valid driver’s license. Promotion Period: The Sweepstakes begins at 12:01 a.m. ET on July 1, 2018 and ends at 11:59 p.m. ET on August 31, 2018. Limit: A person many only enter the Sweepstakes once per day per entry method to get one entry into the drawing for the prize. Prize(s): The grand prize consists of a 2018 Chevrolet Camaro plus a 2 day/2-night VIP trip for 2 to attend a race in November 2018 at Texas Motor Speedway.